Last year I celebrated Pi Day by using SAS to explore properties of the continued fraction expansion of pi. 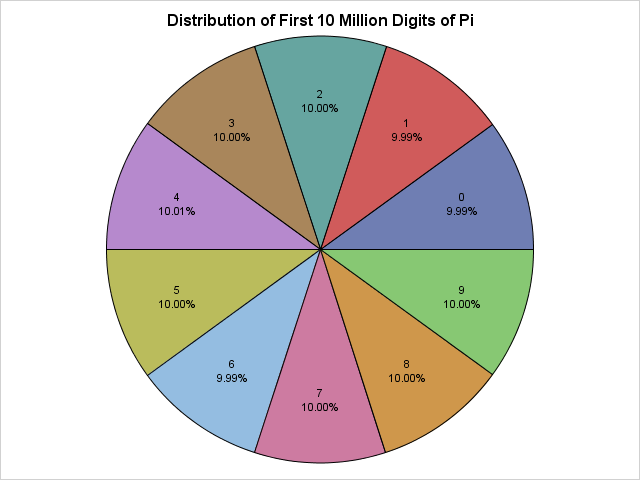 This year, I will examine statistical properties of the first 10 million digits of pi. In particular, I will show that the digits of pi exhibit statistical properties that are inherent in a random sequence of integers. Editor's note (17Mar2015): Ken Kleinman remarked on the similarity of the analysis in this article to his own analysis from 2010. 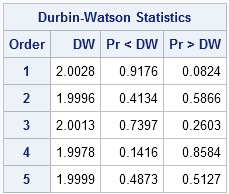 I was reading his blog regularly in 2010, so I should have cited him for the chi-square and Durbin-Watson analyses in this post. My apologies to Ken and Nick Horton for this oversight! For other ways to use SAS to download data from the internet, search Chris Hemedinger's blog, The SAS Dummy for "PROC HTTP" and you will find several examples of how to download data from a URL. You can run many statistical tests on these numbers. It is conjectured that the digits of pi are randomly uniformly distributed in the sense that the digits 0 through 9 appear equally often, as do pairs of digits, trios of digits, and so forth. The frequency analysis of the first 10 million digits shows that each digit appears about one million times. 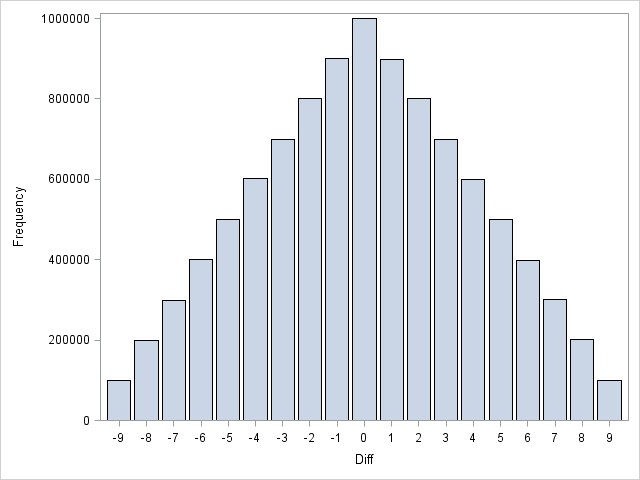 A chi-square test indicates that the digits appear to be uniformly distributed. If you turn on ODS graphics, PROC FREQ also produces a deviation plot that shows that the deviations from uniformity are tiny. The pie chart appears at the top of this article. It shows that the digits 0 through 9 are equally distributed. Any autocorrelation in the sequence? That's a pretty cool triangular distribution! I won't bore you with mathematical details, but this shape arises when you examine the difference between two independent discrete uniform random variables, which suggests that the even digits of pi are independent of the odd digits of pi. Are the digits of pi random? 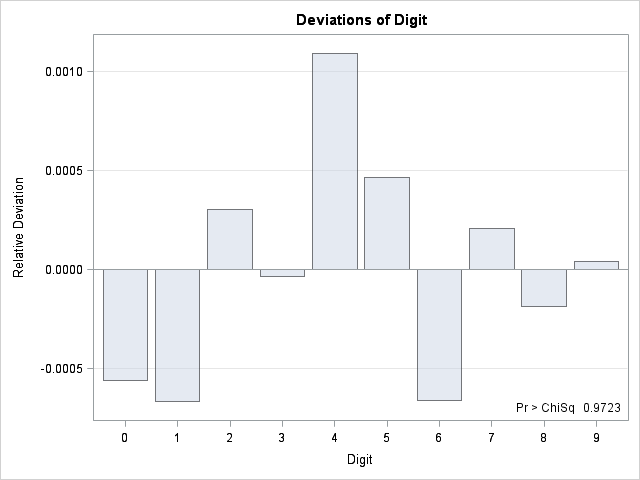 Researchers have run dozens of statistical tests for randomness on the digits of pi. They all reach the same conclusion. Statistically speaking, the digits of pi seems to be the realization of a process that spits out digits uniformly at random. There it is! The numeric representation of "Pi Day" appears near the 4.7 millionth decimal place of pi. Other "messages" might not appear in the first 10 million digits, but this one did. Finding Shakespearian sonnets and plays will probably require computing more digits of pi than the current world record. The digits of pi pass every test for randomness, yet pi is a precise mathematical value that describes the relationship between the circumference of a circle and its diameter. This dichotomy between "very random" and "very structured" is fascinating! Happy Pi Day to everyone! Some of your readers will have another chance to celebrate, and this time it will be an international holiday. Very cool! My new goal is to make that my time of death. I don't know how to manage it, but John Adams, Thomas Jefferson, and James Monroe all died on the 4th of July so I will try. I'm fascinated by the beauty of your autocorrelation analysis... pi - an irrational number with some intriguing properties! Your readers may be interested in some similar and dissimila analyses we did a few years ago. Nice analyses. Thanks for the link. I have added a direct link from within the article. I am curious to see a similar analysis of e, and phi? Any possibility? Email me direct if you could show me how to do it. one million digits of "golden ratio"
you will find the data. Have fun! Interesting! There something I do not understand though...If the digits of PI have a uniform distribution based on chi-square 2.78 at 10mill, how come if you calculate chi-square further, at around position 86mill you will get a chi-sqare of 8.9 suggesting it is not uniform. There is an even smaller chi-square at around 12million (~0.9) so I find it strange that the chi-square would then increase. Remember that a statistical test at 0.05 significance will reject a true hypothesis for 5% of random samples. It would not surprise me to find regions in the sequence of pi that test as "nonuniform" for a while. Some of these issues are addressed in "How to lie with a simulation," which coincidentally is also about pi. 3.141592... can u have 1000000000000000000000000000000000000000000000000000000000000000000000000000... digits? Bad statistic for the First million of digits of Pi !! How can it be that a number so precise and important to math, science, and nature turns out also to be a random number generator? It seems almost self-contradictory. Indeed, yet it is true. In fact, almost all real numbers have this property. There are other instances of order within chaos, such as iterations of the logistic map x -> 4*x(1-x), which leads to chaotic dynamics for almost every initial condition, yet also contains infinitely many periodic trajectories. The mathematical universe is strange but beautiful! 1. If it *weren't* random--if it really did have a pattern--would it then necessarily be rational? 2. Is it possible that pi actually DOES have a pattern that reveals itself, say, after 31.41592653589 trillion digits? The pattern is groups of ones that repeat 1, 2, 3, 4, ... times. The pattern never repeats, so the number is irrational. 2. Yes, it is possible. It is conjectured that pi is an example of a "normal number," but until the conjecture is proved, no one can be certain. Yes, I should have deduced that a pattern of digits can exist without repetition, and thereby still represent an irrational number. But it is irking me that numbers like pi and e might be infinite random sequences of digits, with no underlying structure or pattern...because at least intuitively that seems to imply that the natural phenomena they so beautifully represent are somehow intrinsically random as well. Silly idea, but maybe it's related to the probabilistic nature of quantum physics: If there WERE a pattern (like 0.1011011101111...) then we would KNOW the number even though we couldn't write it all out or represent it as a ratio. But if there is NO pattern or structure, then we can never really pin it down...like an intrinsic uncertainty. We can get closer and closer but never completely represent it. No..no, I'm wrong again, I'm always wrong, because pi and e are easily represented with tidy infinite sums. Aha, so infinite sums can therefore be random number generators?! I see I'm a little too existential, and not quantitative enough, about all this. Not being random does not imply having a pattern. If you take pi, and replace every '9' by an '8', it isn't random anymore (as it will have no 9's and twice as many 8's as any other digit 0..7), yet it still doesn't have a pattern.